German Frers is the architect who conceived her, and Nautor's Swan is the boatyard that makes her. With the 112RS, Nautor's Swan has applied its exclusive design for the first time to a super yacht. 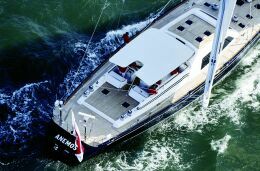 Easy to manoeuvre in all sea conditions, the possibility of navigation with a reduced crew, and high level sailing performance, are just some of the designers' ambitious objectives. The experience of Nautor's boatyard, rightly considered one of the most important in the world in the production of sailing yachts, is demonstrated in the 112RS, with the volumes of a large cruiser and the performance of a maxi racer. For the most demanding boat owners, those who want their yacht to be tailor-made, Nautor's Swan offers the possibility of designing the interiors together with the Nautor Design Team in order to structure the spaces in the most appropriate way for each specific set of requirements. Swan is famous for producing sailing yachts in which high level performance manages to be combined with maximum attention to details, and with the 112RS this production philosophy is seen at its height. Every component has been designed and produced specifically for this model. 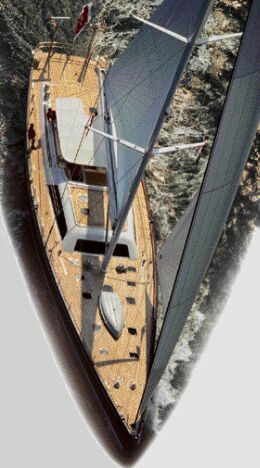 As a result, Nauter's Swan has created original and harmonious internal and external layouts, in which nothing, from stem to stern, looks out of place. Technologies able to offer a particularly resistant structure under mechanical stresses but at the same time sufficiently light to ensure high level performance, have been adopted to construct the hull. This objective has been achieved by using uni-directional fibres reinforced with laminated vinyl for the hull. Before delivering a 112RS, the yard submits every model to severe tests at sea, and thanks to which, besides controlling the quality, gives the yard the opportunity for making adjustments to the impressive sail area and all the on- board systems. 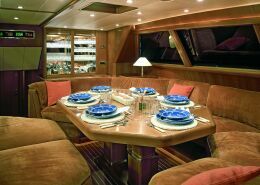 Nautor's Swan's experience is also seen with the 112RS through the numerous details on the deck. Here great attention has been given to ergonomics with the aim of maximising the control of manoeuvres, thus allowing for a reduction in the number of deck crewmembers. 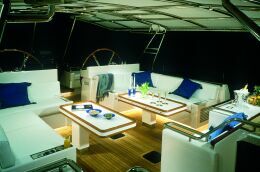 The deck can also be personalised according to the requirements and habits of each individual boat owner. The boat is made of GRP in a sandwich structure with closed cell foam glued to the hull with a technology that ensures perfect seakeeping also under extreme mechanical stress. The cockpit in the stern area includes a double control station, with duplicated manoeuvring mechanisms and instruments positioned at starboard and port, a solution that allows for maximum visibility and total control at any speed. 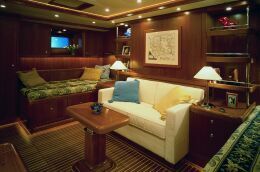 Astern of the area dedicated to the control of the yacht is a large living area with two L-shaped sofas with tables, a bar and bench fixed to the floor with the seats facing the stern. From here access is gained to the interior, in the large padded bowels of the impressive hull that cuts the water like a great marine predator. 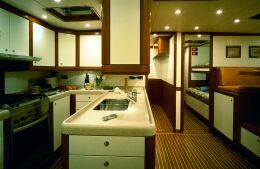 The copious internal spaces of the Swan 112RS have allowed the boatyard to design and produce different layouts. Nautor's Swan's objective, with the development of the 112RS project, was to create a yacht with which the boat owner can travel around the world in maximum comfort and in conditions of complete safety. 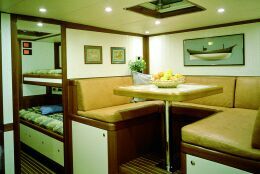 The comfort is undoubtedly of a level unlikely to be found on "pulled" sailing yachts, thanks to that fact that the spaces everywhere are generous and fitted out with skilfully worked prestigious materials. Every component on board reflects the intention of the yard of making each 112RS unique. But the safety element has been Nautor's Swan's guiding principle for attaining its objective. What's more, the 112RS is intended for those who choose to embark on a tour of the world in complete relaxation, without pursuing oceanic records or classifications. Nevertheless, as we have already said, her level of performance is very high, this is a result of her waterline length of as much as 28.16 m. and of water lines combined with an impressive but proportioned sail surface. In order to achieve such high standards of safety, Nautor's Swan has chosen materials able to provide maximum performance in the mechanical resistance/weight ratio such as, for example, the mast of more than 39 m. made entirely of carbon fibre. Remaining on the subject of figures, the boom reaches almost 13 m. in length and the total sail surface with the genoa jib at 110% is 583.3 sq.m, to which we can add the 712 sq. m. of the asymmetric spinnaker. The figures are also impressive with regards to the mechanical propulsion; the motor is an MTU of 414 HP and is located in a spacious engine room where the generator and main mechanisms of all the on board systems are situated. Continuing with the figures, the ballast keel has an overall weight of 28,000 Kg., drawing 4.54 m. and the displacement at full load of the 122RS is 129,000 Kg. Naturally, the boat's range is appropriate for the possibilities offered by such a hull; the fuel tank in fact can hold 6,500 litres of gas oil, while the capacity of the water tank is 3,000 litres. However, the desalinator installed on board is able to produce drinking water every day in abundance. With a careful reading of the technical schedule, it's not difficult to imagine what persuaded the boatyard to sum up the possibilities of the 122RS as "Sailing without limits". The story of the Nautor's Swan boatyard began in 1966 when Pekka Koskenkylä, its founder, constructed the first sailing yacht of 10 m. made in plastic reinforced with fibreglass. After this beginning, already in itself adventurous, there was the meeting with the great designers Sparkman&Stephens, who were responsible for designing as many as 800 of the first 1,000 sailing yachts produced by Nautor's Swan. Pekka Koskenkylä then realised that the key to success was production in series and the combination of high level performance with living comfort. Important sporting successes then began to arrive such as those obtained with the "Sayula II", the Swan 65 originating from a series production, that won the first Whitbread Cup in the years 73/74. 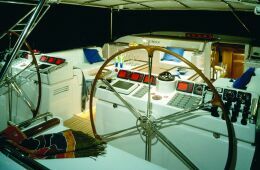 The design of this yacht also turned out to be a winner also afterwards, during the second edition of the Whitbread Cup which took place in the years 77/78 and which saw Swan 65's arrive at 2nd, 4th and 5th place. The contact between the Finish boatyard and German Frers occurred in 1979, a partnership which leads us to this splendid 112RS via many designs that have become famous among oceanic regatta lovers and simple pleasure boaters. Frers has designed many boats destined to make a name for themselves for a long time; it's worth pointing out that his first design dates back to 1957, when at 16 years of age, he designed the boat of his dreams, a sloop of 10 metres which then made yachting history as being the first GRP hull to be constructed in Argentina. From 1965 to '68 the designer moved to New York where he worked with Sparkman&Stephens. So far, Frers has completed more than 500 sailing and motor boat designs, from cruisers to regatta boats, from 20 to 200', yachts considered as the best in the world. His hulls have won editions of the Admiral's Cup, the Whitbread Cup, the Sardinia Cup, the Cop del Rey, the Giralia and other prestigious sailing competitions. He came to Italy in 1989 as group leader for the design of the "Moro di Venezia" and after the positive experience in the Americas Cup he decided to open an office in Italy. The "Luna Rossa" design, winner of the Louis Vuitton Cup in 2000, is his own. Nautor's Swan is now managed by Luciano Scaramuccia, assigned to this position by Salvatore Ferragamo, the Italian businessman who decided to purchase the boatyard after becoming the owner of a Swan, which he literally fell in love with. Today, the productive rhythm of Nautor's Swan is increasing, and as a result new Nautor's Swan productive areas are about to be opened in Finland. Salvatore Ferragamo's objective is to increase production whilst maintaining the qualitative standards that have led Nautor's Swan to its unquestioned and merited success. Although the boatyard's exclusive designer is German Frers, Nautor's Swan does not intend to take part in the Americas Cup with one of his hulls; nevertheless the yard continues to participate with success in major sailing sport events. In addition, it has created the by now famous Nautor's Swan Cup, reaching its 12th edition, which, will take place in Porto Cervo from 8 to 15 September 2002 in Sardinia. At present the Swan range includes yachts from 45 to 112', all designed for comfortable and rapid cruises, but also challenging regattas such as those which have made Swan a point of reference in yachting.